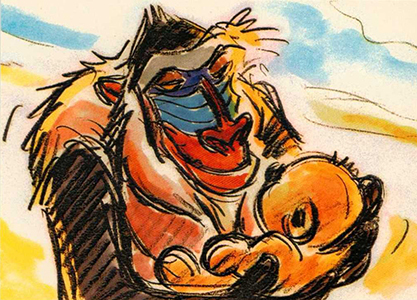 1994 SkyBox Lion King is one of the biggest entertainment trading card releases of the decade. It certainly helped that the film was a massive success that led to plenty of spinoff merchandise. Cards were also given out in Burger King Kids Meals, which is about a big a stage a product could ask for. While this hasn't translated into lasting values, it's still a fun set that has a little bit of everything given the era it comes from. The set is split between two series. 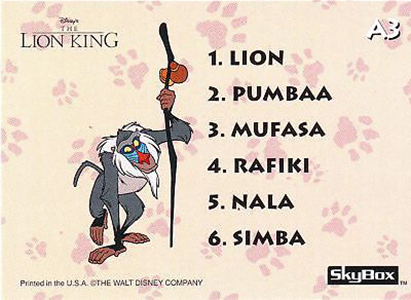 The 1994 SkyBox Lion King Series 1 base set has 90 cards that retells the story, covers key characters and more. It continues much the same for the 80 Series 2 cards, offering even more depth. Card fronts are basic. They have a full-bleed image and no caption. Backs provide the details, giving the writeup and a second image. Most of the inserts are meant to be handled and played with. The toughest are the two Series 1 Lenticular cards (1:180 packs) and Series 2's Foil Border cards (1:90 packs). Other insert themes include Embossed Foil, Pop-Ups and Thermographic. Walmart packs have a pair of exclusive inserts that are easy to find as they both landed one per pack. Series 1 has Coloring Cards while Series 2 has Activity Cards. 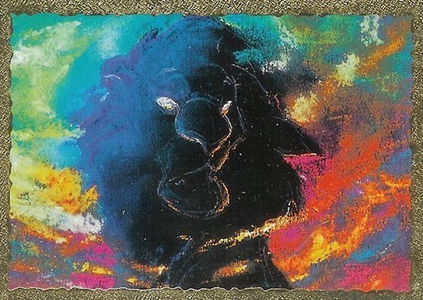 Because of the massive supply, 1994 SkyBox Lion King trading cards remain readily available. They're also reasonably cheap, even for the toughest inserts. Two different binders were made for the set. One with Simba was made for retail. A second binder, which has Pride Rock, was available exclusively at the Disney Store and is significantly tougher to find. 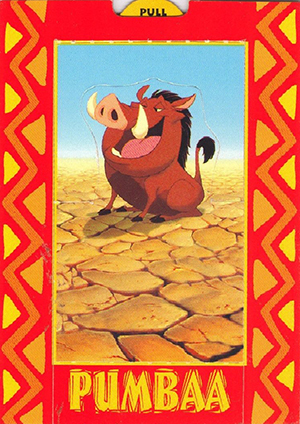 SkyBox also produced a Lion King tin set that could be considered a separate release. It has a 50-card checklist, all of which are done in a tallboy format. The factory set has a production run of 15,000 copies. 171 cards. Series 1 #1-90, Series 2 #91-170 plus no-number title card. Shop for base sets on eBay. 06 "Don't turn your back on me!" 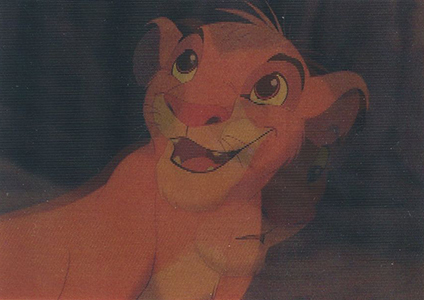 10 "I just can't wait to be king." 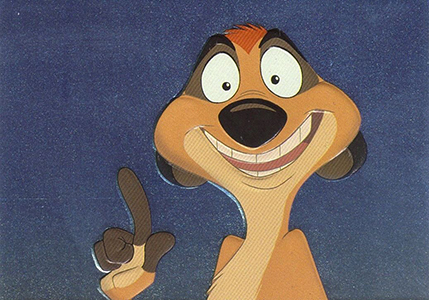 16 "I laugh in the face of danger." 18 "Did we order this dinner to go?" 22 "The kings will always be there to guide you." 31 "Long live the king." 38 "Jeez, it's a lion!" 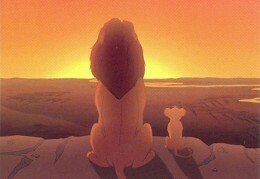 48 "You said you'd always be there..."
50 "I know your father." 51 "He lives in you." 52 "Remember who you are." 57 "I'm a little surprised to see you -- alive." 59 "It was an accident." 83 Man, Are You Ugleeeee! 84 Dangling at the Bottom of the Food Chain. 85 Who You Callin' Oopid-Stay? 86 Sit Down Before You Hurt Yourself. 87 Mooo Oooo Oove It! 88 Home Is Where Your Rump Rests. 92 Where Have I Seen This Before? 125 "I Just Can't Wait To Be King"
141 No Worry and Responsibility? 164 "I Know Who You Are." 165 "Look Harder... He Lives In You." 166 "The Question Is: Who Are You?" 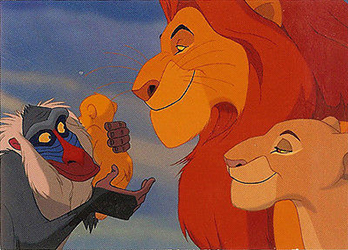 167 "You Follow Old Rafiki. He Knows The Way." 168 "Asante Sana Squash Banana." 5 cards. Inserted one per Series 2 Walmart pack. 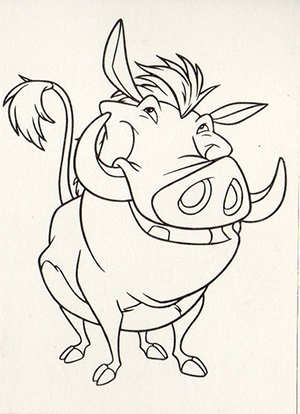 A4 Help Pumbaa Find His Favorite Food! 5 cards. Inserted one per Walmart pack. 9 cards. Inserted 1:12 Series 1 packs. 2 cards. Inserted 1:90 Series 2 packs, 1:200 Walmart packs. 2 cards. Inserted 1:180 Series 1 packs. L1 "I Never Get to Go Anywhere!" 10 cards. Series #P1-P5. Series 2 #P6-P10. Inserted 1:24 packs. 9 cards. Inserted 1:9 Series 2 packs. T5 "Let's Rustle Up Some Grub!" My sister recently passed away and I have quite a few 1994 Disney Lion King, Disney, lenticular, holograph, pull ups and other cards. Also, Pepsi, Marvel, Star Wars, Race Car driver, McDonald’s, Casper, Coca Cola, Toy Story, Hercules and other various cards. Please let me know if it would be worth selling them or not. So Sorry to hear about your loved one. I had a very hard time with the clothes I had on but I made it through, hopefully I will be able to help out more. Sincerely, Mitzi.